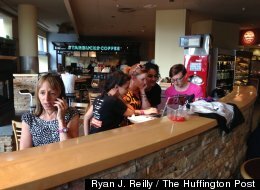 Medea Benjamin (left) of the anti-war activism group Code Pink fields media phone calls at a Starbucks after she interrupted President Barack Obama’s major national security speech Thursday, May 23, 2013. (Ryan J. Reilly/The Huffington Post). WASHINGTON — Even Medea Benjamin was surprised she managed to get into President Barack Obama’s major national security address at National Defense University on Thursday. The long-time Code Pink protestor (and HuffPost blogger) is a fixture on Capitol Hill and well known to most D.C. reporters. Benjamin, 60, was escorted out of the the hall after she repeatedly interrupted Obama’s address, pressing the president on the use of drone strikes overseas, including the killing of a 16-year-old U.S. citizen. In an interview with The Huffington Post afterward, at a Starbucks near National Defense University, Benjamin said someone had given her an invite to the speech. “I had an invitation, somebody gave me an invitation who I’m not at liberty to disclose,” Benjamin said, calling her protest “epic” when compared to her other demonstrations. Benjamin said she was led out of the room and questioned by on-site Army personnel, as well as Secret Service and FBI agents, before she was let go. “I must say, I do really appreciate that I live in a country where if you interrupt the president you don’t get beaten and tortured and thrown inside a prison for a year,” she added. Benjamin believes similar actions would have gotten her arrested had they occurred during a congressional hearing. “I’ve been arrested so many times in Congress, it’s ridiculous,” she said.